Is it your time to quit? Are you worried about the effects that smoking could be having on your health? You may have even tried several times to quit before, yet been unsuccessful? Perhaps you’ve been a smoker for many years & can’t even imagine life without cigarettes? Have you ever considered hypnotherapy to help you quit smoking? 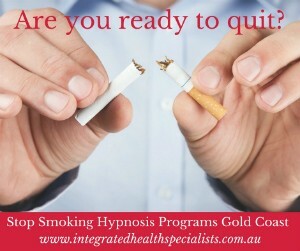 Our Stop Smoking Hypnosis Program on the Gold Coast can help you to overcome the struggle and become a quitter today! 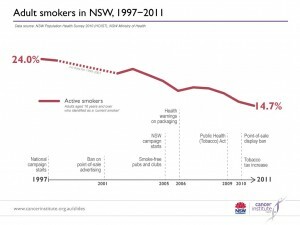 Smoking rates have been steadily declining in Australia since cigarette advertising was restricted, and anti-smoking campaigns began to take effect. However, the rate of adult smokers is still around 15%. Whilst many people have become more health conscious in recent years, and awareness around the risks of smoking has increased, people who have been smoking for longest tend to have the most difficult time quitting. Whether you began smoking many years ago as a young adult, or only took it up as a ‘social’ habit recently, smoking is so insidious a habit that it can be difficult for anyone to break. Whilst many people turn to fixes such as nicotine patches and e-cigarettes, the rate of success is incredibly low. This is because the reasons for smoking go well beyond the simple addiction to nicotine. Deeply ingrained behaviours and habits are difficult to ‘kick’ without investigating and addressing these behaviours. A study done by New Scientist magazine found that hypnotherapy increased the chances of quitting from just 6% (using willpower alone) to 60%. In fact, hypnotherapy was more successful than nicotine replacement therapies, whose success rates were as low as 10%. Our Stop Smoking Hypnosis Program has been developed by our qualified Psychologist and Hypnotherapist with over 25 years experience; who understands the nature of addiction, and the difficulties involved with overcoming habits such as smoking. Little do many smokers realise just how important smoking is, in their daily lives. Stopping for a cigarette is a habit which many people develop in order to break up the day, manage stressful situations or simply to relax and ‘unwind’ whilst having a drink with friends. Even for those who start out as ‘social smokers’, smoking can quickly become an integral and almost essential part of their day. We are all aware of the dangers of smoking, and yet many of us have a typical ‘it won’t happen to me’ attitude towards the cancers and various other diseases associated with smoking. For those who have been smoking since early adulthood, the idea of breaking such an ingrained habit is almost impossible to imagine. Here at Integrated Health Specialists, we understand the reasons behind addictions such as smoking, and our Stop Smoking Hypnosis Program is tailored to suit your individual needs and understand your personal reasons for difficulty in breaking the habit. Did you know that, beyond cancer, smoking is a leading cause for the following? Whilst disease is a major downside to smoking, it can also result in financial stress and unpleasant side-effects such as accelerated aging of the skin and discolouration of the teeth. In fact, the ageing effects of smoking have been used in Australian advertising campaigns to impede smoking amongst younger users by appealing to their sense of vanity. Hypnotherapy is a safe and effective process, which goes beyond the superficial reasons for smoking, to uncover your unconscious beliefs and behaviours which make it difficult to break the habit. If you have been struggling to quit smoking, and have found other methods ineffective, our Stop Smoking Hypnosis Program may be the treatment you’ve been searching for! 1. Explore the reasons and make sure that you really do want to give up smoking. 2. Schedule 3 hypnotherapy sessions about 1 week apart. 3. A personalised hypnosis recording will be prepared for you to take home after the third session for maintenance. At Integrated Health Specialists, our Stop Smoking Hypnosis Program has helped countless people to finally quit smoking! CONNECT WITH US TODAY to find out more about how our Stop Smoking Hypnosis Program can help YOU to quit – for good! LEARN MORE ABOUT OUR HYPNOTHERAPY SERVICES! For a confidential discussion about your current situation and how we can help you! Integrated Health Specialists is located in Mudgeeraba on the Gold Coast. Join our mailing list to receive latest news, tips and updates! Yes please, keep in touch! You're almost there, please check your email to confirm!